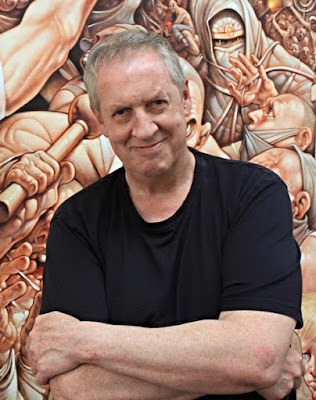 Celebrated artist Peter Howson has returned to South Ayrshire with an exhibition called ‘Babylon’ which features inspirational new works of art. The evocative artist from Prestwick held his first exhibition at the Maclaurin Art Gallery, Rozelle back in 1982 and returns to the gallery which set him on his path to international acclaim. This fantastic new exhibition is taking place as part of Arts at Rozelle which is a partnership between South Ayrshire Council and the Maclaurin Trust. Peter Howson’s work has become instantly recognisable and gives his own unique take on life, reflecting moments of great difficulty but also of great achievement. Ever mindful of his roots, Peter became Patron of the Maclaurin in 2014 and continues to support the gallery. His exhibitions always attract great attention and are among the gallery’s most successful events and this exhibition is destined to be just as popular. Councillor Bill Grant, Economic Development, Tourism and Leisure Portfolio Holder for South Ayrshire Council said: “I am delighted that this amazing exhibition is showing at the Maclaurin Art Gallery, Rozelle. Peter uses his painting to help deal with life’s challenges and his talent enables him to capture the human spirit as nobody else can. Over the years, Peter has used his artwork to help raise awareness of mental health issues and in 2014 he raised funds for Scottish Autism by walking from Aberdeen to Ayr, drawing as he went. These works, all in aid of the charity, were exhibited and sold at the Maclaurin. The landmark exhibition which runs until 6 March 2016 is another opportunity to pick up one of his masterpieces with prices starting at £200 for sketches. Visit www.themaclaurin.org.uk for more information.